Mexican bullfighter Karla de los Angeles has been injured in a bullfight in Mexico City. Ms de los Angeles was going in for the kill during Sunday's event when the bull tossed her over its head. The bullfighter continued the fight after being attended to, but during a second attempt to kill the 495kg-animal (1,090lb), it gored her again. She suffered two cuts of 12cm (4.7 in) and 10cm in length to her thigh and gluteal muscles. The bull, called Gamusino, also gored assistant Federico Dominguez who tried to help Ms de los Angeles in the world's biggest bullring, Plaza Mexico. 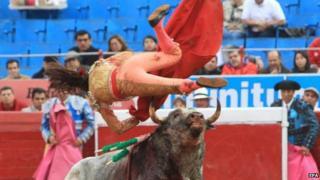 A spectator was also injured when the fourth bull of the afternoon jumped the wooden barrier surrounding the bullring. Bullfighting is a male-dominated sport, but there have been women bullfighters for centuries. In Spain, women were banned from performing as matadors - those who kill the bull on foot rather than from horseback - for decades under the regime of General Francisco Franco. The ban was lifted after Gen Franco's death but to this day there are few professional female bullfighters either in Spain or in Latin America. Who, What, Why: How dangerous is bullfighting?